With over thirty five years of full time design and production, we are more than qualified to help you create your perfect sign! With a modern 6,000 square foot manufacturing facility located in central Florida we are able to fabricate signs out of virtually any material with a wide range of techniques and effects! We have the latest in state of the art sign making technology and know how to combine it with a lifetime of artistic skill. Some of the materials we can offer you are high density urethane or HDU as it's known in the industry, acrylic, plexiglass, aluminum solid PVC as well as Ultraboard, high density polyethylene and Sintra just to name a few. We also work with cedar and mahogany for the rich rustic look and warmth it provides. We specialize in wood signs both carved, sandblasted and 3-dimensional. 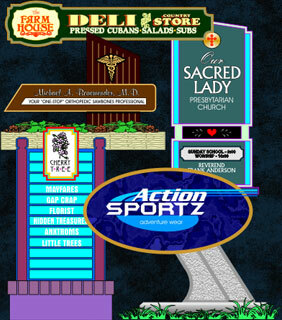 Nearly every sign is a custom design so that your sign will be a one of a kind original. We are the company that everyone comes to when no one else can handle your project. Subdivision signs and entry monuments are one of our newer specialties.